A new look Scott Bader will be launching new gelcoat products at this year’s JEC Europe composites show in Paris, taking place at Port de Versailles from March 12th to 14th. The Scott Bader stand (V18), under their JEC 2013 theme of ‘We think innovation’, will be showcasing their new, unique technology ‘ultra-low styrene content’ spray gelcoat CrysticÒ Ecogel S1PA. This new ultra-low styrene gelcoat, along with their range of closed mould Crystic resins, is part of Scott Bader’s continued focus on offering low VOC fabrication options for converters. This new Ecogel low styrene gelcoat technology will be explained in a JEC open forum technical presentation being given at 3pm on March 13th by Dean Bugg, Applications Development Manager for Scott Bader. 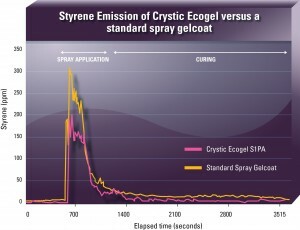 Crystic Gelcoat 15PA is a new vinyl ester (VE) spray tooling gelcoat which Scott Bader is also launching at JEC Europe 2013. It is a high performance tooling gelcoat which offers superior gloss retention. Crystic Gelcoat 15PA is the latest addition to their proven Crystic matched tooling system, which offers mould makers a brush tooling gelcoat if preferred, a VE skincoat and a choice of standard or rapid tooling back up resins. During JEC this year, Scott Bader will also be promoting their new high performance CrestabondÒ M7-05 and M7-15 grades, which extend their primer-less methacrylate structural adhesives range with 1:1 ratio as well as 10:1 ratio Crestabond product grades. Scott Bader claims that the two 1:1 ratio grades are particularly good at bonding galvanised metal and other difficult to bond metals and plastics with no need for a primer, and have much higher elongations than competitive adhesives products with superior adhesive performance. In line with their Advanced Composites strategic focus, Scott Bader stand at JEC Europe 2013 will mainly focus on the high performance resins, gelcoats and adhesive products in their range. This will include their CrestapolÒ acrylic resin range, with a special feature on a new flexible thin GRP pipe fabricated by filament winding fibreglass with Crestapol 1250LV; stand visitors will be able to handle and test out the flexibility of this innovative filament wound flexible GRP pipe themselves. Crestapol 1250LV has been developed to also exhibit excellent performance with standard sized Carbon Fibre, and Crestapol 1250LV CFRP parts will be exhibited on the stand, including a Wind Energy blade. Other grades of Crestapol, suitable for closed moulding and pultrusion will also be on display, which can be heavily ATH filled to meet demanding fire, smoke and toxicity (FST) performance regulations, and glass fibre or carbon fibre reinforced to suit individual application needs. Neil Gray, Crestapol Resins Global Business Manager for Scott Bader Advanced Composites will be giving a technical presentation in the JEC open forum at 11am on Wednesday 13th March titled: Scott Bader’s Urethane Methacrylate/ Acrylic Crestapol resins for demanding pultrusion and Closed Mould applications and advances into Carbon Fibre Composites. For the first time ever at a JEC show, Scott Bader will have a fully working Scalextric racing circuit on the stand; visitors can have a go at the ‘JEC Paris Grand Prix’ circuit and test their racing skills, with daily trophy winners plus the chance to win the top prize of an iPad for the fastest ten lap race time recorded by the end of the show.